What do you think of our club? Do our meetings and programs meet expectations? What can our club do for you to make your membership more valuable to you? Within the next couple of months you will receive an invitation to meet with a small group of other members and members of our Board. Please accept the invitation and come prepared to speak freely about how you want our club to change or move forward. We also want to know what you like about our club. Your Board has spent this year developing a strategic plan to address the challenges facing our club such as lack of growth and aging membership. But, before we can complete the plan we need your input. This is your opportunity to speak up and, I assure you, you will be heard. You can help direct the future success of our club. You are the future of our club. See the meeting flyer for a form to send with your reservation check. The club will provide fried chicken and drinks; please bring a side dish. No cost. - Small group dinners - Wednesday Oct 19, times TBA by host. Volunteer to host a dinner or attend a dinner. Contact Felicity Sentance - fsentance@gmail.com or Pat Andeweg - pja72@sbcglobal.net. No cost - bring a dish. - Farewell reception and dinner - Friday October 21, reception at home of Roger and Sandy Kaiser, with dinner at Heritage Ranch Club House - $22. Plus other activities during the week - see below or Exchange page. Anyone may participate in any activity. A reervation form will be mailed to members before Oct 1, with deadline of Oct 8. 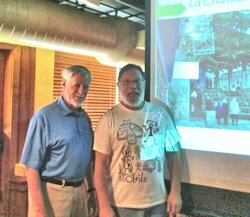 Edward perez and Gerry Arens (left) gave an interesting presentation on the Santiago exchange taken by the club in April. Ray Enstam was the Exchange Director. Edward shared the time spent in Santiago and sights they saw and people they met, while Gerry told about the time spent in the Peruvian Amazon jungle at the Tahuayo Lodge. An added treat was photos from Easter Island taken by Mary Latham on her extension there. Participating in the exchange were Alfonso Mirabal, Joan Mirabal, Galen King, Lou Ann King, edward perez, Paula Rose, Gerry Arens, Isabella Iverson, Raymond Enstam, Patricia Andeweg, Mary Latham and Sharri McIntosh. Paula Rose, edward perez, Sharri McIntosh and Mary Latham didn’t go to Iquitos, but Michael Wald joined that portion for a total of 9 to Iquitos. 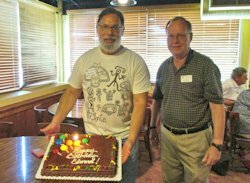 We met at Outback Restaurant in Plano and enjoyed a good lunch and an unexpected dessert - a birthday cake for edward’s birthday; we also honored Art Cooper whose birthday was the following day. Sweet and Savory events were held Sunday afternoon, August 14. Thanks to hosts Sandy and Roger Kaiser, Jackie and Michael Wald, Cathy Ignatin and Jim Kerr. And to Sharri McIntosh for organizing the groups. Guests at Jim Kerr's house: Maxine Bearden, Patti Niemeyer and Gerda Kreyer. We are looking forward to hosting this club on a return visit where we had such a wonderful time in 2015. The dates are October 15-22, 2016 and will include a visit to the State Fair of Texas. We would like to reciprocate the wonderful hospitality they extended to us. Please contact Exchange Director Mary Latham at mary_m_latham@yahoo.com and let her know how you can help. She still needs day hosts, dinner hosts and helpers to set up the Welcome Party and the Farewell Party. Remember, it takes many of us contributing our time to all Incoming Exchanges to make this a success and remain an active club. You don’t have to be an experienced volunteer; there is always someone who can answer questions. Some of the group will be arriving October 15 and some the morning of October 16 so our Welcome party will be lunch on Sunday October 16 at Chimneyhill Clubhouse. A reservation form will be sent by Oct 1. Please complete the form and mail back to Mary Latham with a check for the events you are attending. Deadline to reserve: by Saturday Oct. 8th. Step back in time to revisit Dallas' wilder days. From Tea room to Casino to Speakeasy with an escape tunnel to avoid the law. 10 am - State Fair (take DART to State Fair station.) Seniors get free Fair admission; $16 adults (but discounts available). Purchase own ticket at the gate. Be sure to check out the art deco buildings and food varieties including fried jello and corny dogs. 10 am - Bush Library, 2943 SMU Boulevard, Dallas - $10 group rate tickets; reserve with Mary Latham. Parking $5 per car for the first hour and $0.75 for each additional 30 minutes; paid by credit card upon exiting the parking lot. Cash is not accepted. 4:00 pm - Reception at home of Sandy and Roger Kaiser in Fairview (dressy). Tell guart at gate you are guests of Kaisers - he will have your name. After entering the gate, follow the signs to the clubhouse. People can be dropped off at Kaiser's house first, but park but park at the clubhouse. Walk to Kaiser's home around the corner from the club. The walk is about three blocks. Cost: $22 including water/tea. You may purchase wine or other drinks. Last November we hosted a mini-exchange of 10 ambassadors (the "Georgetown Ladies") from the newly formed FF of Georgetown, TX club. They are now inviting us for a mini-exchange to explore and understand their town and community. The exchange begins Saturday November 5 [arrive mid-day after traveling to Georgetown] and ends Monday November 7 [depart after lunch]. Tentative plans include a tour of the "Most Beautiful Square in Texas" and the courthouse, dinner at Southwestern University (the oldest university in Texas - see link below), lunch at a German restaurant in Walburg (a German American settlement from 1880s), a tour of their community Sun City and a farewell lunch on Monday. So, come join us for a relaxing and enjoyable weekend as we explore a part of Central Texas! Tentative exchange fee: $80 (includes FF Georgetown, FFI and FFD fees). UPDATE: This exchange is full. UPDATE 9/10: This exchange is full. FYI: Leading a Domestic Outbound Exchange is not very difficult as the hosting club does all the planning. As our club ED you work with the hosting club’s ED to determine a schedule and finalize dates. You communicate with prospective ambassadors (our club), take applications and relay decisions and plans to our ambassadors. (If you have not been an Exchange Director before, give it a try. You will get lots of help and training. Plus there are some financial incentives – see Policies below.) It is time to start planning them. The Saskatoon club is waiting for dates to be announced for a festival so that our club can enjoy that event while there. We should hear soon on August exchange dates, activities and cost. Cost: $1200 USD + $200 donation. Come explore the fascinating world of the Mayan culture in the Guatemalan highlands! Although Friendship Force does not currently have any clubs in Guatemala, we will “serve the cause of peace” by putting "friendship in action" as we visit organizations that assist several Mayan communities. During this exchange, we’ll also experience and learn about local traditions, art, languages, historical and current Mayan traditions and customs. We’ll visit the ancient Mayan ruins of Iximche, the village of Comalapa known for its indigenous art, a coffee farm, and a women's weaving cooperative. After arriving in Guatemala City, we will shuttle to Antigua, a UNESCO World Heritage Site, and spend two nights there. We’ll learn about its history and culture as we take a walking tour through the center of town. After lunch, we’ll go to nearby San Juan Del Obispo to visit Proyecto Luis de Lion (a marimba school & community library) and local artists’ homes and galleries. There are so many fantastic activities, sights, and volunteer opportunities on this meaningful exchange! Please consider joining me as we journey through these wonderful cities of Guatemala and see firsthand what a difference our contributions can make. • Inbound Domestic Exchange with Southern New Jersey - Dates TBD in 2018. The Dallas club Board has voted to sponsor a Global Themed Exchange in spring of 2018 (with FFI approval) which will focus on the arts, architecture and culture of our city. The first organizational meeting was held August 11th. If you would like to be involved in more planning contact Felicity Sentance - fsentance@gmail.com / or Mary Latham - mary_m_latham@yahoo.com. Dallas has so much to offer – it will be great to show off our city to the world! Edward perez has headed a committee revising our policies and bylaws. The last policy changes have received Board approval and were listed at the end of the last newsletter - see them in Past Newsletters, July 2016. In addition to policy changes (which may be changed by the Board), there will be by-laws changes published in November newsletter for a vote by the membership at the November meeting. The exchange fee for an Ambassador participating in an Outbound Exchange of five (5) or more days and to one or more hosting clubs may include an Earned Seat fee to cover all or part of the Exchange Director’s (a) travel costs to and from the host community (including required visas or immigration fees), (b) travel and tour costs that are a required part of the exchange, and (c) FF Host Club program fees. The Earned Seat fee should not cover any part of the Exchange Director’s FFI ambassador fee. The total Earned Seat fee amount added to each Ambassador’s fees for an International Outbound Exchange shall not exceed the actual costs of the Earned Seat or $100.00, whichever is less. The total Earned Seat fee amount added to each Ambassador’s fees for a Domestic Outbound Exchange shall not exceed the actual costs of the Earned Seat or $50.00, whichever is less. The Club will allocate a Three Hundred Dollar ($300.00) Inbound ED allowance to each Exchange Director who organizes and manages an inbound exchange of five (5) or more days. The Exchange Director may use the allowance to cover any or all of her/his travel costs, FFI ambassador fee, or FF Host Club Program fees on an Outbound Exchange assigned to or arranged by the Club. The Inbound ED allowance may not be used for exchanges or travel assigned to, managed by, or arranged by another Friendship Force club or by FFI. Qualifying Exchange Directors must use the allowance within 24 months after the conclusion of the Inbound Exchange for which they served as Exchange Director. Any funds allocated as Earned Seat allowances and not used by the Exchange Director within that time period will revert to the Club’s account. This policy will be effective for exchanges concluding as of February 15, 2016. As mentioned in our previous newsletter, your board voted this past spring to define and implement strategic plans for our club - to improve our operations, to involve more members, to attract and retain new members and to interact with our community. We want to involve as many club members in this process as possible. We discussing our mission and vision, membership (attracting and retaining members), leadership (identifying future leaders), club programs and activities (types, frequency, days/times, locations, themes), inbound and outbound exchanges (membership involvement), communication and publicity (to membership and community), and finances. So, when a Board member invites you to a discussion meeting, please join us and share your thoughts, skills, passions, and connections; offer ideas for club activities; and offer your contributions and assistance. We have a Friendship Force page on Facebook. If you are on Facebook, you can type Friendship Force Dallas in the search line and get our page. Then LIKE us and you will receive regular notes, news and photos from our page. • The Facebook page is up but we need a person to manage it and post photos and notices. • The position of chair of the Ways and Means committee is open. • The position of Newsletter Editor is open. UPDATE: Felicity Sentance will resume duties of Newsletter Editor beginning January 2017. A committee is being formed to search for volunteers for our unfilled positions. If you are interested in any of these positions, please contact Mary Latham - mary_m_latham@yahoo.com. FFI raised our member affiliation fees last year (cost not passed on to our members) and discontinued family memberships this year, leaving only individual memberships. The Board has voted to also discontinue family memberships and set the individual member dues at $35 per year, beginning January 2017. The next Board meeting will be August 15, 1 pm at Mary Latham’s home. • Look in the back of your FF Dallas yearbook. You send an email with the place, date and time you need to go - to the Shuttle Drivers list. If someone is available, they'll contact you. When your ride is complete, make a donation to the club. Easy! • How do you know if you have a driver? Since all of the drivers get your request, the person who can drive you will Reply to All including you so the other drivers know you have a driver. Respond (Reply to All) accepting the ride. • Contact edward perez at erperez@acm.org to volunteer. • What do you need to be a shuttle driver? Email (to receive requests and post replies) and a car (to take people places). • How many times do you need to shuttle? As much as you're comfortable with, once a year, once every few months or whatever. • What if you cannot do it anymore? Contact edward perez at erperez@acm.org and let him know. • Do you need to collect any money/checks? No, the rider(s) is/are on their honor that they will send a donation (recommended $30) to the club's treasurer. If the rider wants to give the money/checks to you to mail/deliver, that's up to you. The rider may offer you toll fare or gas money. It's up to you to accept or decline. Thanks to all drivers and riders who help support our club. This is a great fundraiser for our club but we need MORE DRIVERS. Send your news to Felicity Sentance, fsentance@gmail.com and mwilliamstxtravel@yahoo.com - by October 25 for the November Newsletter. Share what you are doing with your FFD friends. Welcome to new Newsletter Editor, Felicity Sentance, who will take over fulltime in January 2017. Remember to use our website for your club questions, dates, opportunities to travel with other clubs, photos, articles and much more. Hilda Klosterman had her 9th surgery in late June - another hip replacement. Because of the short length of the femur, her hip kept coming out of the socket - starting on their trip to Germany. She ended up in a brace and in a wheelchair there, and they have tried again to get something to work for her. She is recovering at home. Pat Andeweg had a repeat surgery to repair neck vertebrae Aug 18th. Condolences to Patty Niemeyer whose oldest sister died last week. You can receive her other information from the President or Webmaster. Sandy Kaiser is dropping one of her two email addresses: coachs@abilene.com . Please use only coachs@grandecom.net. Please change this in your club and internet address books. Teresa Wilkin is moving to Panorama Independent Living near Olympia, WA. On behalf of our entire family, we wish to thank you for the beautiful flowers honoring Zia and for your heartfelt emails, wishes and tributes. He cared so much about Friendship Force - and about each of you. Thank you so much for sharing this passion with him. Morocco. 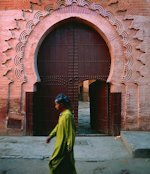 The conference venue/hotel is in the L'Hivernage district of Marrakesh, a 10 minute drive from Marrakesh Menara International Airport (RAK). Attending from Dallas are Charlene Clements, Jim Kerr and Teresa Wilkin. See the FFI page on the Conference for more information. Following feedback from members, our 40th Anniversary World Conference in the UK has been extended by an additional night. As previously planned, on-site registration will take place in the lobby of the Midland Hotel, Manchester, all day on August 24, 2017, so the updated conference dates are August 25 to 28, 2017. Mary Mwambay and Ana Smulski are leaving and we wish them well on their future endeavors. Matthew Nidek has assumed an expanded role supporting general operations beyond Programs as FFI’s Director of Operations, while Kaitlyn Ranney has moved from Programs to become the Director of Marketing and Communications. Program Managers are now called Regional Support Managers (RSMs). Laura Romero has an expanded role of Regional Support Manager and IT Manager and is responsible for the deployment of the new database and website, along with several other IT-related projects. Since we are over halfway through 2016, we are sure you are eagerly awaiting Friendship Force’s 40th Anniversary year next year in 2017. We want to let you know we have some stellar celebratory plans in the works for this monumental year in FFI’s history, including ways that all of our clubs can celebrate with us right in their own backyards. Stay tuned in the coming months for more details on these celebrations and all of our excitement for our 40th next year! Friendship Force has enrolled in Delta Airlines’ SkyBonus program. Now, you can support FFI when booking flights directly through Delta, while still earning your own SkyMiles rewards! Read more on the SkyBonus FAQ on the FFI website - www.thefriendshipforce.org. Remember that you are welcome to join other clubs on their exchanges if there is room. When you travel with another club you help fill their seats and make new friends in another club as well as your destination club. See the FFI World of Friends Catalog for a list of all exchanges with openings: http://www2.thefriendshipforce.org/catalog/ffi_listonly.aspx. If you are interested in any of these exchanges, contact the Exchange Director ASAP. The decision for an exchange to go or to cancel occurs at least 90 days preceding a scheduled date. Notice of remaining seats can be out of date as exchanges fill and there are cancellations. Contact the ED for the most current information. Please contact clubs well in advance, as an exchange may cancel if the Exchange Director doesn’t know about your interest. See where some other clubs are going on our Other Clubs page. Dallas earned 3 stars and a “worth a trip” rating from Michelin Guides, impressing the Michelin visitors, according to the Dallas Morning News – (August 7, 2016 article). They especially liked the art deco buildings at Fair Park, a “hidden gem.” The Dallas review is included in Michelin’s “Louisiana and the Southern Cities” Green Guide – for now published only in French.